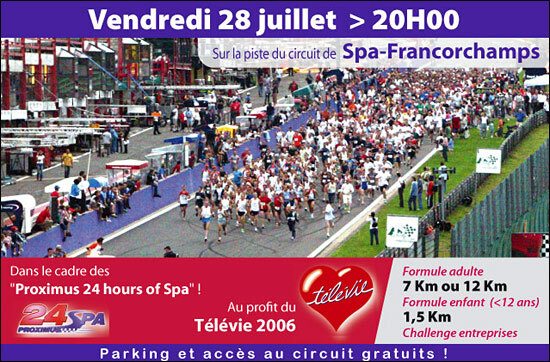 20.00 on July 28 at Spa, the evening before the Proximus 24 Hours, will see large numbers of adults and children running around the Spa-Francorchamps circuit. Half a lap of Snetterton on July 15 – and/or a full lap of Spa (more if you wish) on July 28 – that’s the choice for anyone who feels fit enough. The Spa run is to raise funds for leukaemia research – and there’s a choice of a 1.5 km run for children, and 7 or 12 km for adults. The children’s event begins at 20.00, the adults’ race at 20.30.